York 9 FC was announced at a Toronto event last week as one of two sides to compete in the League's inaugural match this coming spring, set to face off against Hamilton's Forge FC in a road match on April 27. Brennan and his executives also announced a special treat for the hundreds who have already booked their seat for the league's historic first season: all season ticket holders will be bussed to and from the game in Hamilton at Tim Hortons Field, to free seats in a special York 9-only section. Brennan expects around 1,000 supporters to make the journey from York Region to see his team's inaugural match, a roster that has been growing rapidly in recent weeks. Excerpt: The Canadian Premier League is ready for kickoff. 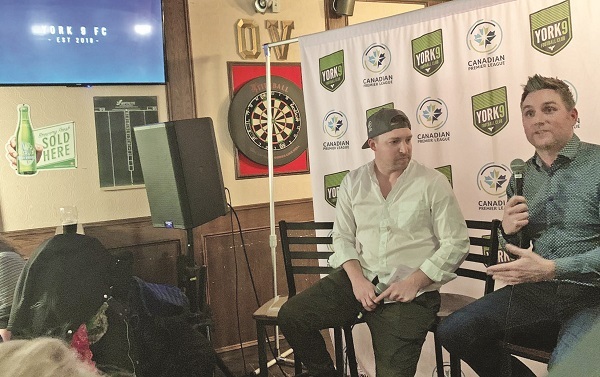 York 9 FC was announced at a Toronto event last week as one of two sides to compete in the League’s inaugural match this coming spring, set to face off against Hamilton’s Forge FC in a road match on April 27.